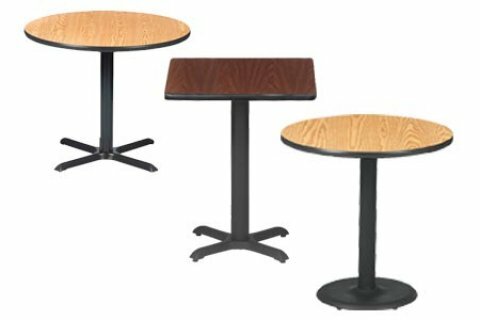 Whether you prefer round, square or rectangular café tables, the wide selection of bar-height tables manufactured by BFM Seating is sure to offer you an attractive, practical dining solution for your school, office or institution cafeteria. 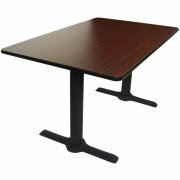 Suitable to arrange in a lunchroom, student cafe or staff lounge, these cafeteria tables are supported by heavy-duty cast iron bases. 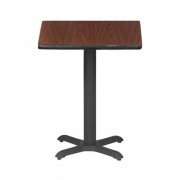 Black frames are powder-coated, and constructed from durable 18-gauge steel, with a 9-gauge welded steel plate for tabletop support. 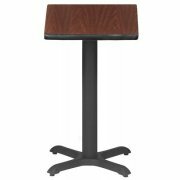 With adjustable glides that ensure accurate leveling, there's no need to worry about sliding trays or cups. Resilient melamine tabletops wipe clean easily, and protective edge banding resists scratching. 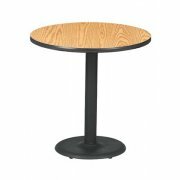 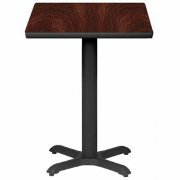 These bar-height, pedestal tables will remain good-looking for many years of tough use.